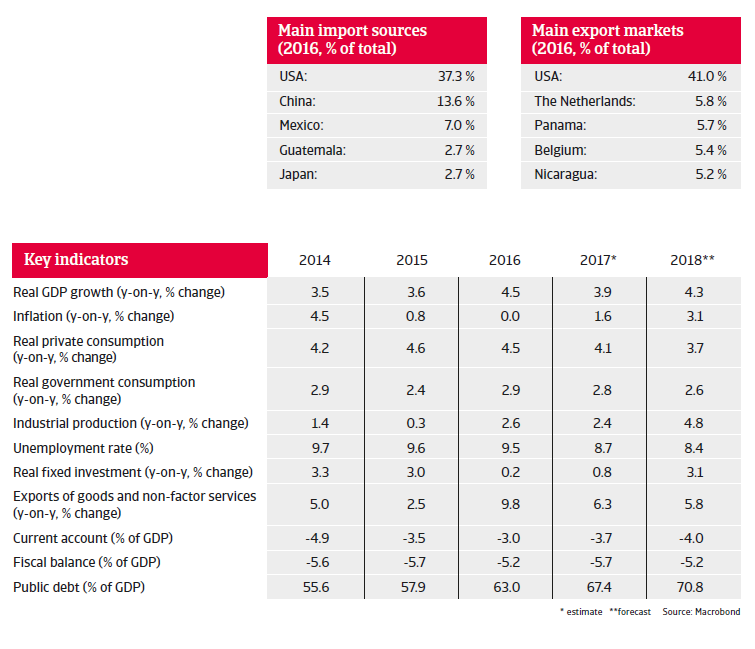 Costa Rica’s GDP growth is expected to accelerate driven by private consumption, robust private, public and foreign investment, and further export growth. Since 2014, Costa Rica has been ruled by President Rivera and the centre-left Partido Accion Ciudadana (PAC). The country remains politically stable, despite the increase in political polarisation in recent years. Legislative gridlock has impeded fiscal and structural reforms – a problem likely to last after the general elections scheduled for February 2018. Costa Rica´s economy benefits from a business friendly environment, a skilled workforce and strong institutions with a low level of corruption. This, coupled with solid private investment, growing public consumption and robust export performance led to solid GDP growth of 3.9% in 2017. 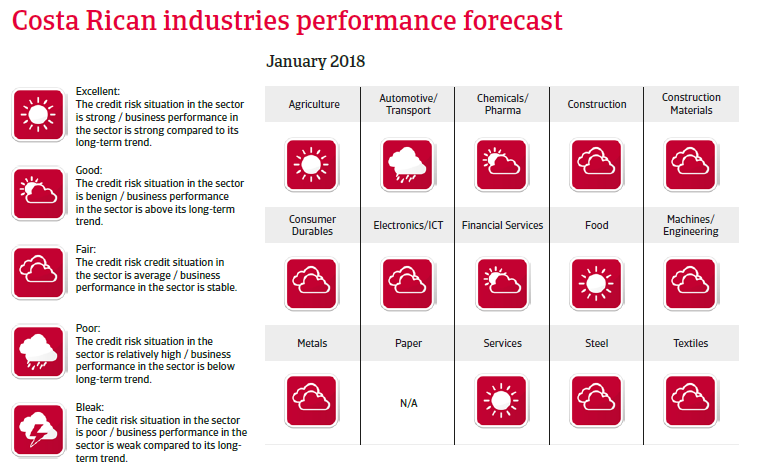 The economic expansion is expected to accelerate to 4.3% in 2018, due to ongoing private consumption growth (up 3.7%, supported by decreasing unemployment), robust private, public and foreign investment, and further export growth (up almost 6%). Inflation is expected to pick up somewhat, but to remain within the target band of 2%-4%. Costa Rica´s economy is heavily dependent on the US (41% of exports, 67% of remittances and 25% of foreign direct investment). So far no major disruption is expected, as, in contrast to other countries, the Trump administration has not targeted Costa Rica in its efforts to revise trade relationships. In order to diversify its economy Costa Rica is also nurturing a partnership with China. 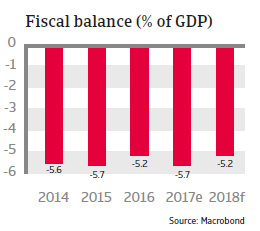 Government finances have deteriorated in recent years, mainly due to high social spending (government debt increased from 56% of GDP in 2014 to 68% of GDP in 2017). 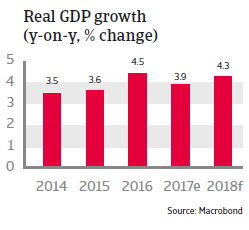 Political gridlock in Congress has diminished chances for the passing of crucial VAT and income tax reforms, and the fiscal deficit is expected to remain above 5% of GDP in 2018. That said, debt composition remains favourable (75% financed domestically, largely by pension funds and banks, with a fixed interest rate and average duration of ten years). External debt is sustainable and liquidity sufficient, while Costa Rica’s payment reputation is good, as the country has not defaulted on its external debt since 1983. The Costa Rican banking sector is quite stable and well capitalized. However, banks are exposed to sovereign risk and a relatively high rate of dollarization of deposits and credits, which means some vulnerability to exchange rate risk. Despite economic diversification agriculture remains a key sector (accounting for 6.5% of GDP and 13% of the labour force). The main export products are tropical fruits, coffee, sugar, beef, and dairy products. Tourism is a growth sector with arrivals increasing 7.3% in 2017 and contributing 5.8% to GDP. The surge in tourism and foreign investment have boosted the expansion of the infrastructure sector. However, downside risks in this segment are delays caused by bureaucracy and the reliance on public spending in times of high government debt. Costa Rica’s pharmaceutical sector is one of the largest in the region and expected to grow further. The country benefits from one of the best healthcare systems in the region, increasing arrivals of ‘medical tourists’ from the US, and is a major manufacturer and exporter of medical instruments.